Whenever I speak with leaders about their greatest struggles, the answer I hear more than any other is a lack of confidence. It’s a universal affliction. Early in my career, I suffered from almost crippling social anxiety. At formal office functions, I’d sweat like crazy and my hands would go ice-cold. Later, as the CEO of Thomas Nelson, I wrestled with heavy feelings of inadequacy. Was I really up for the job? Could I really lead this business through the Great Recession? It turns out that most leaders deal with insufficient confidence. In fact, every effective leader I know struggles with this issue to one degree or another. How do they stay in the game and keep winning? They don’t give in to the fear, uncertainty, and doubt. They struggle against them—and win. I’d like to unpack these seven steps below. In my experience of coaching and mentoring others, virtually anyone can follow these steps to gain more confidence. Clarity. Confidence comes from clarity. Until you get clear on what you’re doing, where you’re going, and what’s at stake, you’ll always be in the dark. And that will leave you feeling vulnerable. The best way to get clarity? Identify your key objectives and start moving toward them. Take the steps that are clear now and the path toward the goal will emerge as you go. Courage. It’s easy to mistake courage and confidence. They look the same on the outside, but they feel very different on the inside. (Thanks to Dan Sullivan for this insight.) Courage is not the absence of fear; it is the willingness to act in spite of your fear. Courage requires you to take a step toward your goals with the clarity you have—even if you’re afraid. When we do this, we make progress toward our goals, and confidence grows as we get closer to our objectives. What’s great is that these steps are mutually reinforcing. If you want to find clarity and courage, the right community can make all the difference. Commitment. At some point, we all want to quit. Every journey has rough patches, periods where it doesn’t feel rewarding or even remotely worth all the trouble. The trick is staying connected to your why? What motivates you? What’s the payoff? The ability and determination to keep going despite the setbacks and challenges is what separates successful from the rest of the field. Celebration. This one isn’t natural for me. Achiever is my top strength. When I score a win, I don’t want to slow down. I want to get onto the next one. But pausing to celebrate our victories is huge for building confidence. Why? Celebration forges a strong connection between accomplishment and positive feelings that can keep our mood up and our motivation strong. Capability. When we face down our fears and do hard stuff, we usually develop new and stronger capabilities than we had before facing those fears. You’ve probably proven this to yourself a million times in life already. Get through something once, and it’s easier to believe you can do it again. That’s practically the definition of confidence. Pretty soon what once terrified you becomes a matter of routine. Confidence. You’ve arrived. When you reach this point, you’re operating from a place of confidence. You intuitively know you have the capabilities, resources, and strategies you need to effectively lead, face challenges, and reach your goals. But this is only the start. 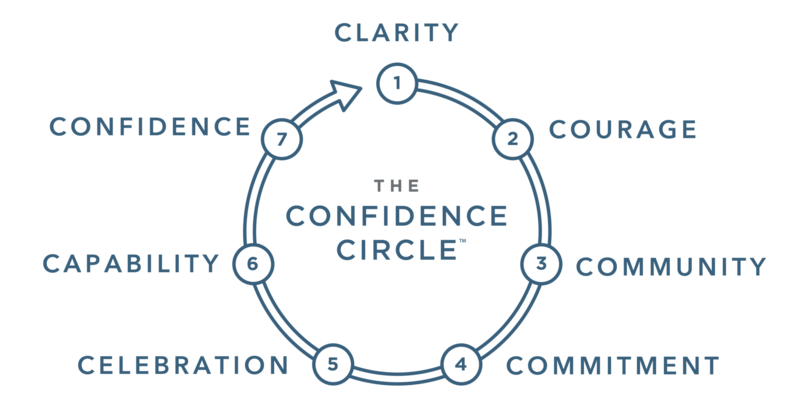 The Confidence Circle™ is more than a loop. It’s an upward spiral. Once you’ve reached a sustained experience of confidence, it’s time to reach for some bigger objectives, some goals that will pull you out of your comfort zone and stretch you. Will you have confidence? Probably not as much as you would like. But that’s exactly the moment you get clear on what you want and get started all over again, building on your progress, and going further than ever before. Question: How is your confidence? What do you need to do to make progress?